With talk with the Majic crew after their performance at Ngāpuhi Festival. Pieter T talks with Taimania at the Ngāpuhi Festival 2018. Arthur Bristowe talks with Taimania at the Ngāpuhi Festival 2018. James Tito speaks with us after performing at Ngāpuhi Festival. Ngā Māreikura speak with us after their performance at the Ngāpuhi Festival. Iwi idol contestant Princess Harris-Cooper has a chat with Taimania after her performance. David Tapere, one of the kaiako of Hatea, speaks with Taimania at the Ngāpuhi Festival 2018. Ikanui speaks with us after Muriwhenua performed at the Ngāpuhi Festival. Robin Nathan from Te Puu Ao speaks with Taimania. We speak to the artists who worked on the mural at the Ngāpuhi Festival. Karakia and mihi for the 2018 Ngāpuhi Festival. Ivan and Te Hurihanga talk about the kaupapa of this year’s Census. Aaradhna performs at the Ngāpuhi Festival 2018. Paua performs at the Ngāpuhi Festival 2018. Majic performs at the Ngāpuhi Festival 2018. Monique Henare-Urwin sings with Aaradhna. Mass haka at the Ngāpuhi Festival 2018. Briana Rudolph performs at the Ngāpuhi Festival 2018. Kasey Carr performs at the Ngāpuhi Festival 2018. Khyla Rupapera performs at the Ngāpuhi Festival 2018. Ngāpuhi Idol Finalist Tane Mahuta Pakeha-Heke performs at the Ngāpuhi Festival 2018. Pieter T performs at the Ngāpuhi Festival 2018. Ngāpuhi Idoal Finalist Kahla Green performs at the Ngāpuhi Festival 2018. Watch Monique's winning performance for the Ngāpuhi Idol competition at #NF18. Watch all the performances and Ngāpuhi Idol on demand. 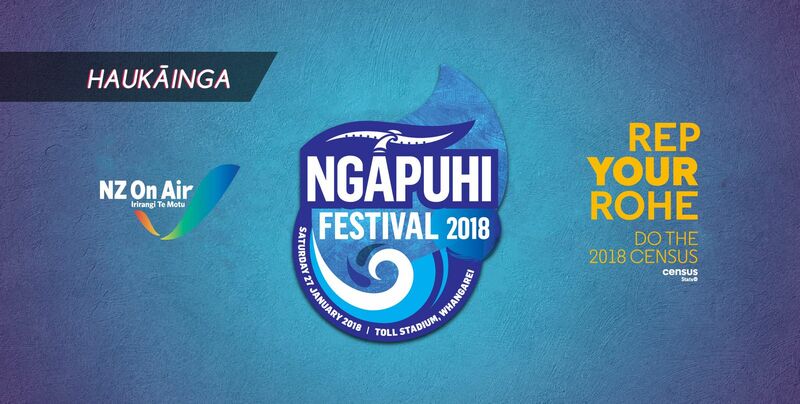 Haukāinga presents Ngāpuhi Festival 2018 brought to you by Te Rūnganga o Ngāphu, New Zealand on Air, and Census 2018 and supported by Te Reo Irirangi o Te Hiku o Te Ika, Ngāti Hine FM, and Tautoko FM.